October 27th, 2011 (happy birthday, dad) was the day we left our beloved Grenada behind. From the moment we lifted anchor at 5am, the clouds emptied themselves and we got drenched in a massive squall. Just like when I said farewell to my best friend Rosie the day before, Mother Nature didn’t seem quite happy to see us go. For hours we were surrounded by massive clouds and the sun came up with a few more downpours. Mark and I estimated an average speed of 5 knots when planning our first trip, but, not being used to downwind sailing and expecting a bit too much from our little cat – of which only the jib was useful (wish we managed to find a used spinnaker, but all our attempts failed) – we only did about 4 knots the first 24 hours. The anchorage at Blanquilla was pretty rolly, but we both enjoyed a great day of exploration ashore and some rest during the afternoon. A visit from the Coast Guard ended our first full day in the out islands of Venezuela. The wind was predicted to die even more over the next days, so we decided to head to Los Roques sooner than later. This time, we counted on an average speed of 4 knots. The first day out, we barely did 3 knots, because the wind was dead behind us at a velocity of less than 10 knots! With our small jib, we barely moved. Irie did manage to catch a fish trap and I had to dive into the ocean to cut the tangled line loose from the prop. Other than that, the trip was very relaxing and the seas almost flat to say the least, but … we had 120 miles to go and hoped to reach reef strewn land before 4pm (when the sun is still high enough for optimal visibility) on the second day out. The way this was going, we were looking at a whole day of motoring again. Then, at night, we lucked out with northeast winds. 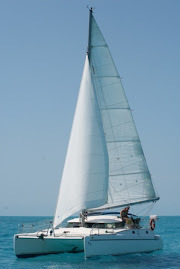 We pulled our mainsail up and managed to sail all night on a broad reach, doing 4.5 knots in about 10-12 knots of wind. It was a happy ride, with clear skies and millions of bright stars. More traffic in this area as well, but all the ships were lit. We caught up some of the “lost” distance and reached Los Roques under sail (during the day back to only jib and slow speeds), apart from the last hour. Now we were ready for a few days of fun and relaxation in these beautiful and out-of-the-way cruising grounds! Pretty big fish caught at the drop-off to Blanquilla. King fish? Not long after leaving Blanquilla for the 120 miles to Los Roques, we caught a fish trap. I "went in" to cut the line off the propeller. View of El Gran Roque from our first anchorage in Los Roques. Slow sail through Los Roques to explore different islands.